This beautiful apartment is located in the heart of Rome, just a short stroll from the Piazza Navona, in one of the most beautiful and liveliest streets in the city. The 90 m2 apartment can comfortably sleep up to six people, and is on the second floor (with a lift) of a historical XVII century building that has been completely reformed. The main entrance leads onto the lounge, with a large table and chairs and a modern, fully-fitted American-style kitchen. The two spacious and sunny bedrooms have wooden beams on the ceiling and ceramic paved floors offering a really warm and cozy ambience. 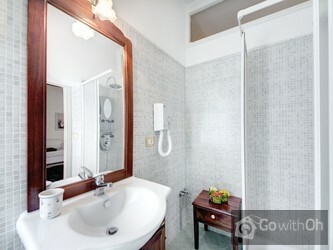 Both rooms have a double bed, single sofa bed, wardrobe, music stereo system, LCD TV and bathroom with shower cabin jacuzzi. The whole house is decorated with beautiful rugs and romantic lamps. The strategic location of the apartment means visitors can walk easily to the Eternal Citys main sites of tourist interest. The location is in the historical city centre, one of the oldest and most typical districts in the world surrounded by beautiful shops and traditional restaurants for visitors to taste real Roman cuisine. The area is well connected to the rest of the city with nearby metro station Barberini-Fontana di Trevi (line A). El apartamento es estupendo; las habitaciones son amplias y el baño muy completo. La cocina es pequeña pero perfecta para cocinar, tiene de todo (sartenes, ollas, platos, vasos, copas...), y hasta disponíamos de comida y bebida. C., la persona de contacto en Roma fue muy amable en todo momento.... Muy recomendable sobre todo por su ubicación. El único comentario negativo sería que hacía mucho calor del salón, porque no había AC (únicamente en las habitaciones). 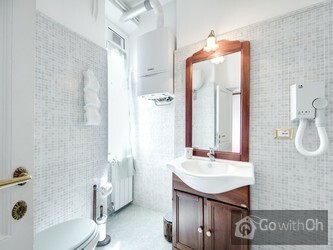 El apartamento esta muy bien ubicado y está acondicionado de maravilla, los cuartos de baño equipados con todo tipo de productos: gel, cremas hidratantes..., En la cocina tanto la nevera como la despensa llenas, ha sido supercómodo nuestra estancia. La persona de contacto ha sido amabilisima ...explicandonos con todo detalle cosa interesantes a ver... en fin un 10 por esto y por la profesionalidad y tambien amabilidad de la organización oh-rome en Barcelona. El departamento, además de ser muy bonito y confortable, está ubicado en un lugar sumamente adecuado para conocer Roma y disfrutar de la noche, restaurantes, caminatas, etc. La sra. Cinzia ha sido muy amable y en el dpto no faltaba nada de lo mostrado en las fotos, incluso tenia su alacena y ...heladera con comestibles para degustar en caso necesario. Es muy recomendable. Sofia. Fantastic location and friendly owner. Appartement très bien situé, proche de toutes commodités. Excellent accueil de C. encore mille mercis!!! Lo mejor sin duda la ubicación,la calle Via del Governo Vecchio tiene un ambiente fantástico, está cerca de todo incluidas dos de las mejores pizzerías, tan solo a unos pasos de la Pizzeria Baffeto y de Pizzería La Montecarlo. Todo cerca, super bien comunicado, con mucha zona de restaurantes y ...gente joven, pero al mismo timepo el apartamento era muy silencioso entre otras cosas pq da como a un patio interior, pero no eran necesarias las vistas para unos días. Las habitaciones amplísimas lo cual se agradece y en la casa hay de todo, incluido todo lo de los desayunos, huevos, yogures... Nosotros hemos quedado muy contentos y desde luego lo recomendaremos, nunca habíamos utilizado este sistema de apartamentos ni conociamos la agencia, pero C. y Oh Rome han sido del todo profesionales. Perfectly located for ALL important sights in Rome. Wonderful quarter, everything you need you will find in the street, starting with a supermarket the best Icecream and best Pizza in Rome and, last not least, wonderful nightlife locations. Being in the centre of it all was a fantastic location. We loved the apartment and especially C who was lovely and very friendly. The wonderful pedestrian street is full of great shops, cafes, and Bars, so in combination with the great apartment we couldn't fault a thing! Highly recommended! Cynthia has a lovely apartment with facilities in very good condition,both bedrooms and bathrooms are very spacious,the kitchen was a bit tight for room but taking in to account the appartment is over 300 years old and you are in the best part of Rome its not a big problem.All tourist sites are able... to be accessed by foot saving you money from catching a taxi or going on the hop on hop off bus.The cobbled street the apartment is on has many restarants and up market clothes shops with a supermarket 100m away for you to shop and save money.15m away is an Irish pub which has on the latest sports from Australia,England and America,just what you need after a hard days touring.By the way the Piazza Navone is 5 minutes walk away and is well worth visiting at night for the atmosphere.A great find. Cynthia was great. Appartment was exactly as advertized. Loved the location with the wonderful restaurants & one of the best gelato we found in Rome. Easy access to so many great sites in Rome. Taxi can access to drop you at door. Excellent location close to everything we needed - great resturants meters away - and the best gelato shop les than 200m away on the same street. C. (owner) coundln't have been more helpful and accomadating re arrival and departure times. Apartment was comfortable - bedrooms and bathrooms and... kitchen great - no real living room and the decor a little dated. We would defnately book again and recommend. zona centrale, che permette di raggiungere le principali mete turistiche anche a piedi. pittoresco e nel contempo, visto che l'appartamento ha le finestre rivolte all'interno, silenzioso di notte. Perfect location. Comfortable and clean. But showers need attention. One had no pressure and was unusable and the hot water was only luke warm as the hot water unit kept cutting out. Beste Lage inmitten der Altstadt! Gute Ausgangsposition für alle wichtigen Sehenswürdigkeiten! Somos una familia de 5 miembros y hemos estado 4 días en roma , el apartamento esta fenomenal , situación inmejorable para ir con niños , todo roma andando , la próxima vez vuelvo seguro. Es war alles in Ordnung, die Lage war ideal. Nur haben wir eine Kaffeekanne vermisst, es gab leider nur einen kleinen italienischen Espressokocher. Es un apartamento estupendo en todos los sentidos.fui en un viaje en familia.ubicacion excepcional y apartamento calido. Nous avons été très bien reçus et avons passé un séjour très agréable, l'appartement est très bien situé dans un quartier très agréable, permettant de faire la plupart des visites à pieds. This apartment was excellent, well appointed, clean and comfortable and accommodated four people with room to spare. 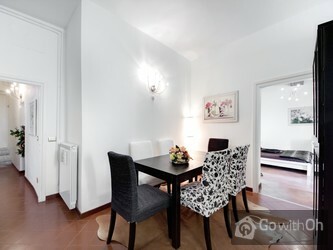 The location, so close to Piazza Navona, was wonderful and within walking distance of many other major Rome attractions. The street was full of lovely shops and restaurants and ...there was no need to go far to enjoy delicious food. Cynthia, the owner, was an outstanding and gracious hostess. 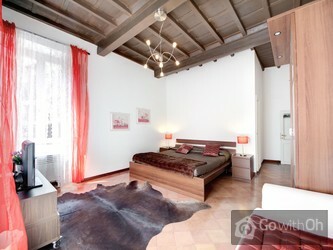 We highly recommend this apartment and would certainly return when we are next in Rome. Die Lage der Wohnung ist ganz ausgezeichnet, mitten im centro storico.Die Wohnung ist sauber und zweckmäßig eingerichtet, genug Lampen, aber keine zum Lesen geeignet.Die Kontaktperson ist eine reizende , sehr hilfsbereite Dame. It was very dark inside. On the photo's you see lots of light , but the reality was different. There was also a musty smell. The kitchen & the refrigerator were too little. The kitchen is only equipped for breakfast, not for cooking for 5 persons. But what me bothered most of all , was the fire... safety. There was no emergency exit, no fire escape at the back of the building. If there was a fire, we would have been stuck like a pig in a pen. I didn't sleep well because of this. The location was very good and the owner very friendly but those are the only 2 positive things. For this motive, we also indicate the size of the apartment and add a floor plan to the apartment description on our website which allows clients to verify the size and distribution of the apartment before booking. Also, please note that according to Italian law, tourist apartments are not required to have emergency exits. 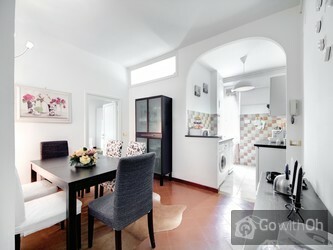 Een zeer net en heel rustig appartement midden in Rome! Alsof je een andere wereld instapt als je het appartement verlaat: vanuit de rust middenin bruisend Rome. Super! We kregen twee paar sleutels zodat je ook apart van elkaar weg kunt. En de hulp van de contactpersoon is geweldig. We vertrokken op... onze laatste dag pas om 17.40 uur met het vliegtuig en mochten onze bagage in het appartement laten en deze om 15 uur halen, omdat ze het die dag niet verhuurd had. Anders had ze een andere oplossing gehad. Daardoor konden we heerlijk nog een dag genieten van Rome zonder alles mee te moeten sjouwen. Er is Wifi in het appartement en een telefoon ie je gewoon mag gebruiken om bijvoorbeeld een taxi te bellen (die overigens ook vlakbij staat) Al met al: super appartement!! 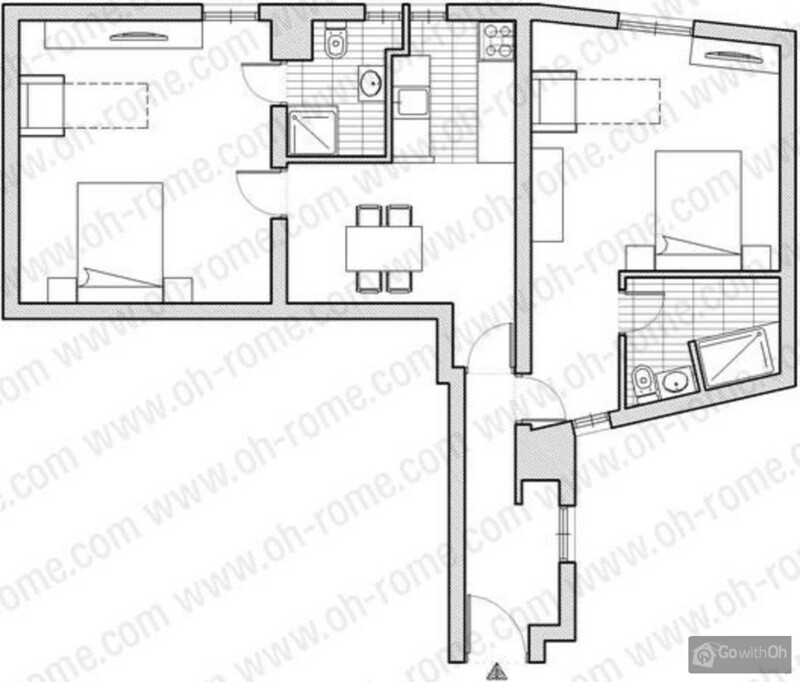 The apartment is at a great location, very close to Piazza Navona and other main attractions. There are plenty of options to eat with one of the best gelato, pizza and coffee restaurants in Rome close by.The owner is very friendly and easy to work with. The apartment is well furnished....I found the... kitchen a bit small Overall, I was very satisfied with my stay and highly recommend this apartment to everyone. La localisation de l appartement en fait LE LIEU IDÉAL pour profiter de son séjour. Le standing de celui ci ainsi que de l immeuble sont irréprochablesL hôtesse a été merveilleuse avec nous C est un appartement que je recommande et dans lequel je compte bien retourner . 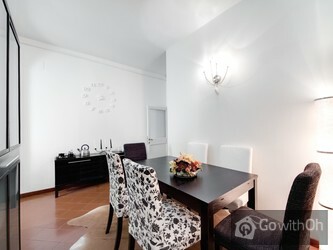 The appartment is superbly located - close to all the major sites. We were able to walk to most of the places we wantred to visit. 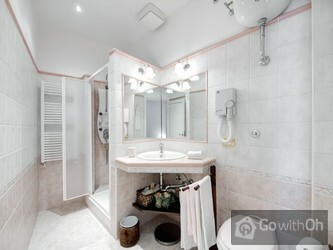 It is clean, well furnished and ideal for two couples. The owner is very friendly and extremely helpful. We particularly liked the 'help yourself and replace what you use' policy for the kitchen. Mme C. est une femme généreuse, pleine de bons conseils. elle nous a réservé un accueil très chaleureux.L'appartement est très bien situé, décoré avec gout, tout y est fonctionnel, propre, bien aménagé.Je le recommande vivement.Un grand merci à Mme C.
La propriétaire est très gentille. L'appartement est propre, bien chauffé et très bien situé. Il y a même une machine à café avec des capsules, très pratique. Par contre ce n'est pas la peine de réserver un taxi privé par la propriétaire. Prenez un taxi officiel de l'aéroport au centre ...ville, le tarif est fixe à 48 et vous n'aurez pas à attendre. Les chauffeurs des taxis officiels sont plus aimables aussi que le taxi privé que la dame nous a envoyé qui ne nous a dit un seul mot, ni fait un seul sourire, tout ça pour 20mn d'attente en plus et 50. 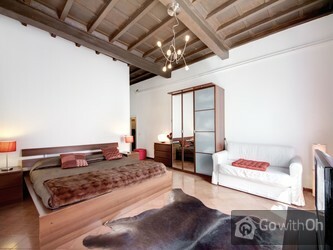 Perfect location right next to Piazza Navona. 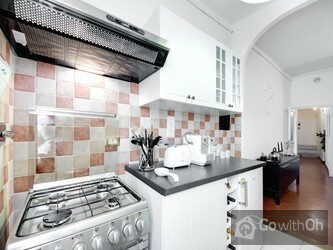 Apartment was on a quiet Side street with many dining options nearby. Size was perfect for our family of 5. Very clean. Beds were comfortable. Fantastic support from the owner/manager who greeted us on arrival and helped orient us to the neighborhood. 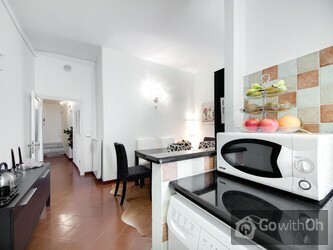 ...Highly recommend this apartment for any stay in Rome and would absolutely stay here again. Accueil chaleureux, la Propriétaire parle français. L'appartement répond bien aux critères présentés sur le site, les douches sont à revoir (une douchette manquante et pommes de douches en partie bouchées par le calcaire).Pour le reste rien ne manque. Cuisine bien équipée, WIFI sécurisé,... etc.Appartement très calme car situé côté Cour. Emplacement idéal, pour rejoindre à pied la plupart des lieux historiques: Colysée, Vatican, Villa Borghese, Ruines de la Rome antique.Rue animée en permanence, on y trouve une multitude de restaurants, commerces, ainsi qu'un CarrefourExpress.Pour le petit déjeuner, je recommande le restaurant «EST», situé vicolo della cancelleria.Pour une excellente pizza, le BAFETTO est à une centaine de mètres.QUE DU BONHEUR. The location was perfect! The owner C was very welcoming and very helpful and the apartment was also perfect and we will return. 6 of us stayed here in May for a week. We were less than impressed with this apartment for the price paid. It did not live up to my expectations of an "elegant apartment". Firstly, when we arrived, not all the beds had been made up and the owner had to call back her girl to finish off while we ...stood around and waited. After the briefest of introductions, the owner left us and the girl to it. We were not told what to do with rubbish, how the keys or the intercom worked. The linen was old, the towels smelt and my sheets were bobbled and it was like sleeping on a cheese grater. The shower in my room didn't drain properly so had to turn the shower off half way through to allow time for it to drain before turning on again to finish off. Couldn't get tv to work.On the plus side, it was quiet. Location was good, but that's probably all the good I can share. Owner seemed disorganized. Lights were missing everywhere (Bathrooms and bedrooms), Towels that were provided were small, old and didn't smell very good at all. Drain in the bathroom of the first bedroom did not drain very well. Most ...times we showered in ankle deep water...owner's reply: "there's calcium in the water so it happens. I'll need to look at it again" Never heard back from her. Dear Customer, We appreciate and value your comments, as they help us to improve the service that we and the owner offer. The owner confirms that they replaced the bulbs were missing and that always delivers a set of 3 towels per person: a small, medium and large (bathrobe type). The owner also informs us that by allowing you to enter the apartment before the scheduled check-in that the cleaning was still not finished, so the apartment was not fully prepared for your stay. We also confirm that everything indicated by the customer has been reviewed and fixed. The flat is in an excellent location - we could walk to the major sights, and the distances were fine for our 10-year-old son. There is a variety of great restaurants and ice-cream shops nearby. There is a fantastic patisserie too - turn left out of the building and take the first left and it's a ...few doors down on the right. The flat is lovely and very quiet. The owner was very helpful and booked us taxis to and from the airport. I would definitely recommend it. Un appartement calme, bien équipé et propre. Très bonne situation qui permet de faire la plupart des visites touristiques à pied. Bon contact avec la propriétaire qui parle le français. The location is very good. Within walking distance to a number of places that we wanted to go to and surrounded by so so so many restaurants. You will not starve at all. Its also easy to get cabs around there. Host is very friendly and nice. C sehr nett, superpünktlich, hervorragendes Englisch!Gerne jederzeit wieder, Lage war einfach traumhaft! (1min Bus 64 Termini - Petersplatz), 1 min Piazza Navona zu Fuß, kleiner Supermarkt 1 min. Pizzeria Monte Carlo 1 min bietet leckere Pizzen zu günstigen Preisen!Bäder schön, eigene ...Handtücher mitnehmen, Küche sehr gut ausgestattet.Wenn nochmal Rom, dann gerne wieder so.Achtung Taschendiebe !!!!! Auch gerne in überfüllten Bussen! The apartment was amazing and the owner wonderful! This was already our 3rd time there and we definitely recommend this place! Die Lage ist sehr gut im Quartier von Piazza Navona. The shower head needs to be replaced, otherwise everything was perfect, we loved the apartment, it has a great location and the contact person was very helpful and lovely. The location was amazing. Close to everything- C was right on time to meet us. We enjoyed the restaurants, Gelato and market close by. Simply wonderful. The owners were wonderful. Très belle situation centrale, bien desservi en bus, proche de nombreux magasins, resto...Appartement calme (sur cour non bruyante), chambres et sdb spacieuses, coin cuisine plus petit mais bien équipés.Bonne literie. Idéal pour 4-5 personnes max. Great location 2 large bedrooms and good size onsuites.All the kitchen facilities you need.Only negative was the size of the bath towels they were like hand towels.